I am on a much-needed vacation right now (two weeks! ), and am at my parents' home in Southern California. My parents moved into this house when I was in college, so although it's in the same city where I lived for five years before leaving for school (eight grade through high school), I never actually lived in this house, except for a few summers. But I still have "my" room, and I still have my stuff. The books on my shelves are an odd mixture of books--I'm not sure how they all ended up here, but every time I'm home I do enjoy perusing the shelves and remembering the books I read as a kid and teen and young adult. The lower shelves are mostly the books I read for school in college, but the upper shelves are the books from when I was younger. Here's a sampling of one shelf. I love the absolute randomness, from fantasy to science fiction, to romance, to classics, more movie and TV tie-in books than I realized I read, and to the Cheerleaders series, the books Grace and I shared because of the Asian-American character featured. And, of course Stephen King. I think I read every Stephen King book published starting in 8th grade. We were unbelievably tickled by the phrase, "blown to bits before their eyes" in relation to a girl being killed in a terrorist bomb. Who writes this stuff, anyway? (Well, now I know.) We laughed and laughed over that line, and on my next birthday, the book was one of my gifts. And I ended up actually reading and enjoying the book and bought and read a few others in the series. I had a crush on Joe Hardy. Have any of you read this? I loved this book. Wish I knew where my copy went...it's not on the shelves in my bedroom. I'll continue to hunt through my parents' house while I'm here. One thing I really miss in my life is re-reading books I love. I reread books all the time as a kid. 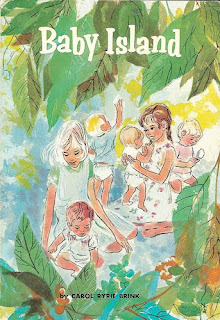 I'm sure I've read Baby Island at least three times. Perhaps I should allow myself to reread at least one book each year without feeling guilty that I'm not reading something new and not reading submissions. I think it would be good for my soul. If only I could find Baby Island while on vacation! I'd read that. I totally relate to missing the rereading. I've actually moved a lot of my children's books to my adult apartment, and I do reread them a lot. Send me your parents' address and I'll get a copy for you -- I was going to buy it anyway, you made it sound so good! Just remember to bring it home and give it to me the next time I see you. Baby Island! I'd forgotten about that one. I remember the sand/powder thing the most. Thanks for the nostalgia! "blown to bits!" I remember that! That was hilarious, even as 7th graders we knew that was over-the-top writing! Loved, loved, LOVED the improbable Baby Island as a kid. I had one with a different cover as a kid, but found one with that cover at a yard sale in the last few years and had to have it. 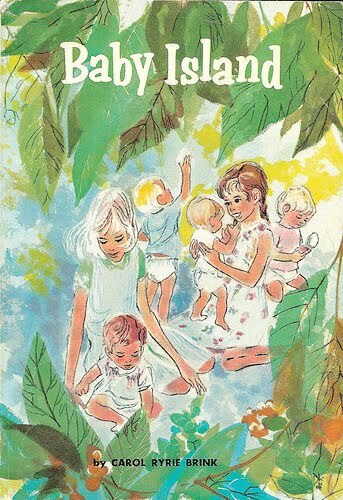 I loved Baby Island too! Just found my copy...I think I bought it because the cover of my copy has a Titanic-y looking boat sinking in the background, and I was obsessed with all things Titanic. Speaking of books you re-read all the time, Baby by Patricia MacLachlan is that one for me. I read it at least once a year. OH NO! Eyewitness Charity Auction has begun! Desmond is out today, hurray! Two BRGs in the NY Times Book Review today! What's the most torturous part of writing?